Videos, ranting, and book rec (7QT) | House Unseen. Life Unscripted. The other day my husband dropped an enormous truth-bomb on me as I was standing, all unsuspecting-like in the kitchen. Are you ready? when everyone else is laughing at -a- I'm laughing at -b-. Like the punch line is something I totally ignore and what I'm laughing at is, like, the way the person bobs their head around or the dude falling over in the background. Or the fact that Brian Fellow wears 16 ounces of lip gloss. Speaking of which: Brian Fellow's Safari Planet. It is the best. Oh, speaking of stuff I laugh at, I promised on the fb fan page the other day that I would try to get Cecilia's chicken sound on video. It makes me so happy. Also, note that she is such a contrarian that she couldn't just go with chicken or hen. Oh nononononono. She had to switch it to "rooster" at the last second, which is obviously a total lie, as you will discern yourself when you watch this. Oh, can we get all mommy-blog up in here for a sec and talk about Cecilia? We went on a "field trip" on Thursday to a friend's farm with a bunch of other Catholic homeschooling families in the area. I'm talkin an adult to child ratio here of, like, 1 to 7. Seriously. There I am with my puny 5 children, two of whom are practically old enough to join the AARP, and WHO is the only tiny human causing a scene? You know das right. She was honestly like "But I don't wanna go in the barn!" and then "I don't wanna go out of the barn!" and then "I don't want water!" and then "But I need waaaaaaaaaater!" and then "I can't carry this water!" and then "Give me back my water!" Lather, rinse, repeat. Meanwhile all the other children are following their saintly mothers like adorable little ducklings, asking appropriate questions and not at all acting like walking-advertisements for exorcisms. And I've got Mary in the carrier on my chest and a smile grimace plastered on my face hoping that it would seem like I'm one of those patient and kind people who should be allowed to have children. Small person? Y U NO BE SWEET AND COMPLIANT? Yummify with olive oil, red wine vinegar, salt and pepper. Confession: New little kids' books mostly make me want to poke my eyes out, so whenever I come upon an older gem or remember one, I have to share it. 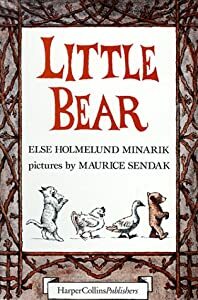 Today's installment is Little Bear by Else Holmlund Minarik, illustrated by Maurice Sendak. Because boring books don't make kids want to learn to read, amiright? Little Bear is the best! We love those! Oh Cecilia is do definitely a hen and NOT a rooster. Quite impressive..I think she has a real future in chicken impersonation. It's something about the name... Those Cecilias are tyrants! I taught a Cecelia oncee who was totally lovely but she was already a teenager, so maybe she had already been through the tyrant phase. Or maybe that extra E turned her good. Whatever, not worth spelling the name wrong to ensure good behavior! Also, I love Little Bear! John Paul acts them out all the time, especially the story about the hiccups. And "A Kiss For Little Bear" always makes me laugh because of the totally abrupt and hilarious ending! And oddly enough, just last night, my almost 9-year-old pulled out an old Little Bear easy reader and read it several times proclaiming it her "new favorite book ever"! That 'I CAN READ' version was the first book I read myself, and therefore is tucked away for my kids someday, if I ever actually trust them to touch it. #6, must try, I'm always looking for new and easy recipes, but how do you boil an egg? Just kidding :) or not? I've been eating #6 a lot, too, lately and love it. I had to look up how to boil an egg. Not kidding! It had been at least a decade. Joy of Cooking says to put eggs in a pot of water and bring to a boil, then turn off the heat and let them sit for 12 min. Works for me. The shells don't crack that way. I've even made them in the microwave. I make a few days' worth at a time. #7: My Girl 1 and I love Little Bear too. lovelovelovelove little bear. Especially the one where he thinks he can go to the moon. Silly old bear. Whoops, wrong bear. Ship Cecilia here pronto. Maggie needs a sister and I need daily laughs that only she can provide. Also what a healthy version of an egg salad. Totally having it on the one day a week I don't eat eggs for breakfast. LOVE Little Bear! Love him so much that I checked out one of his books for my grandchildren, and then his mom (hi, Rosie!) told me that the kids already had that book. Whoops! Blah blah blah, everyone else's comments. Ken and I have listened to Cici's video 12 times. Not weird. I also have plastered that same grimace on my face, with such gusto that it DARED anyone to ask me about my insane child's behavior. ASK ME ABOUT MY POSSESSED CHILD, I DARE YOU!!!!!!! Just like that. My husband does his voice SO great. Wish I could sneak record him. Haven't heard it in ages...college maybe? Admittedly - never honed in on the gloss!!! lol. I will now though, thanks Dwija! She could be in the Bluth family with that chicken noise! I will be making a similar salad asap, because the lettuce with two Tbsps of TJ cilantro dressing and 3 oz of grilled chicken strips is wearing on me. If you like Little Bear, you will love Oliver Pig. I love Oliver Pig and his sweet mama. All of my boys loved Little Bear. Loved. And my best friend has a Cecilia. And she was a handful when she was little. But now, she's a lovely, darling 16-year old with a heard of gold. And I just love her like she's my own. So there's hope. And I totally ADORE hard boiled eggs. Definitely trying your lunch suggestion. #1 Check #2 check #3-5 LOL! I have the same little person in my house! #6 Thank you. #7 Kids love Little Bear, too but I love House Unseen more than Little Bear. Haha! That's hilarious. The shiny lips were always a little bizarre to me. Also re: #6. Have you ever tried apple cider vinegar? It is the healthiest, tartest, bestest of all the vinegars. My kids loved Little Bear! And my son especially loved the one where he went to space. Also, Frog and Toad. FROG AND TOAD, I'm telling you. The one called (I think) "Frog and Toad are Brave" is the BEST. Incredible points is found below using excellent content material, superb way with words-at all. I do not recognize how put it into practice but don’t stop! For those as if you occur on the internet.